Kari: I remember this sort of foggily. It’s likely I jumped when Errol belched. I tend to jump whenever Errol makes a loud noise. Errol: I make a loud noise all the time though. I remember it a bit, too. Manpans remembers it quite well. 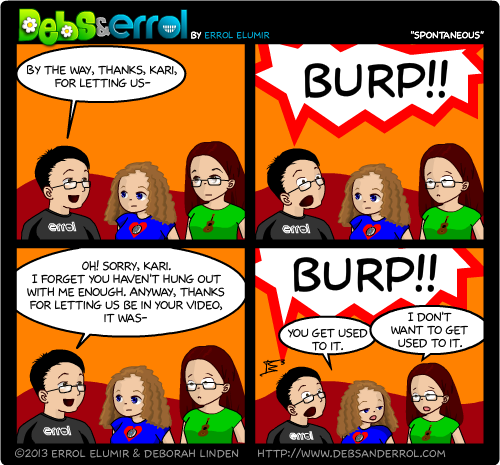 Whitless: I do remember this quite well :D. I don’t actually think Errol’s aware of 50% of the burps that escape him. It’s rather disconcerting. And I remember far too many of them. We’re thinking about teaching the baby how to burp at will. Both I and her daddy learned when we were little kids.